Hey, you got your chocolate in my hazelnut butter! Nutella is no doubt the world’s most popular chocolate hazelnut spread, and in Europe word has it that it’s used as often as peanut butter is here in the US. Now Costco’s got it in giant jars (in a two-pack, no less). Passion for this product runs deep. But is it a healthy food choice? As is often the case with nutrition, there’s a short answer and there’s a long one. Nutella is OK in moderation, like once a week or less. So, go ahead and spread, but try to keep your portion at 2 tablespoons or less. Best brand that’s doing it better than the rest is Justin’s Chocolate Hazelnut Butter Blend. But chocolate hazelnut spread is most definitely not a food that I would recommend trying to get more of in your diet (like blueberries or black beans). There’s room for improvement in the ingredients and there are healthier options available. Want to know more? For the long answer, keep reading. And, if you make it all the way through you must be as much of nutrition nerd as I am! 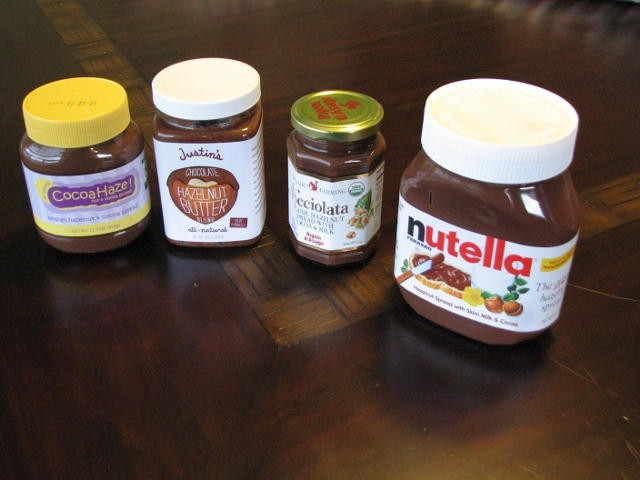 The most famous brand is definitely Ferrero’s Nutella, but I’ve also found Justin’s Chocolate Hazelnut Butter Blend, Belgium’s Cocoa Haze!, and Italy’s Rigoni di Asiago Nocciolata. Dry roasted hazelnuts, dry roasted almonds, organic evaporated cane sugar, organic cocoa, organic cocoa butter, organic sustainably sourced palm fruit oil, natural vanilla, sea salt. The serving size for all four brands is 2 tablespoons, which makes comparison easy. *Update 2014 — The saturated fat values for Nocciolata changed at some point since I originally wrote this post, so I’ve entered the new value from their Nutrition Facts in the table. And, since Justin’s has revised their recipe I’ve updated the table with their new numbers as well. This is what 2 tablespoons actually looks like. I bought Justin’s at my local Co-op. The 16 oz. jar is normally $9.69, but was on sale for $7.89. They also carried the 9.52 oz. Nocciolata for $4.99, and the standard 13 oz. Nutella for $5.39. This is one case where the healthier version will cost you a bit more. If you have a hard time with portion control, or just want to taste Justin’s without committing financially, it comes in handy, portable 2 tablespoon packs for $0.99 each (pictured above). Check Justin’s website to find out if it’s available in your area. Justin’s definitely has a different consistency – it’s more thick and fudgy than creamy, so it won’t spread the way you’re used to. I like to put a blob on my warm toast and let it sit for a few seconds to soften. Chocolate hazelnut spread is a tasty alternative to peanut butter as a dip for apple slices, and a friend told me that her sister used it to sweeten and flavor her coffee on a recent trip to France. Please share your thoughts. Have you tried any of these alternatives? What are your creative ways to use chocolate hazelnut spread? 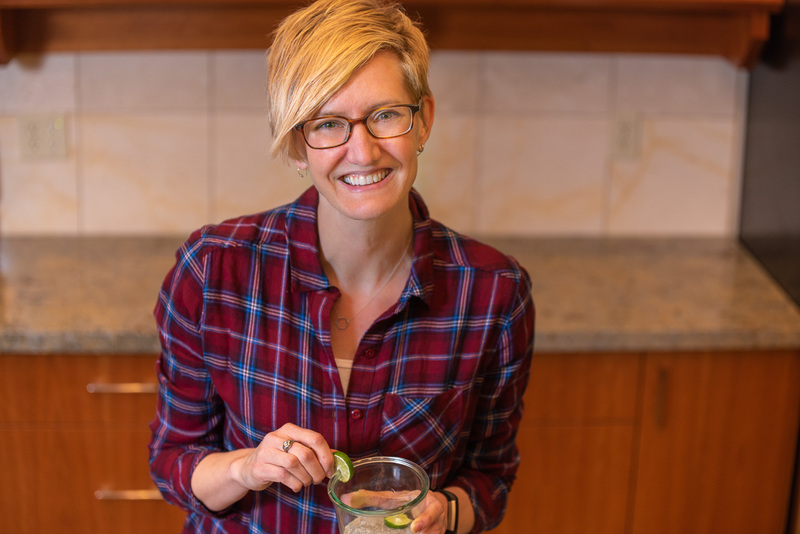 I did make it through the entire blog and am as much of a nutrition nerd as you are and so know that I am in good company! I haven’t tried Justin’s version of Nutella; I am cautious because I don’t trust myself in not eating too much of it. 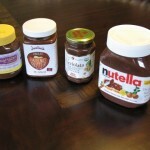 Thanks, Kristine, for such a thorough & educational blog about Nutella and other options. It is salty and not at all hazelnut flavored. Ingredient list puts almonds ahead of hazelnut and taste confirms it. Hi Matt. Sounds like you’re not a fan of Justin’s, but I appreciate your comment. Their product certainly isn’t a perfect match for the original, but as far as nutrition goes, I definitely recommend it. And, I continue to search for a perfect substitute. I enjoyed meeting you last week at Chefshop. Your blog content is great and I love your visuals. Do stop by next time you are in Seattle. Hi Sharon. It was great meeting you, too. Thanks for taking the time to check out my site and for making my visit to your store so lovely. I like Justin’s quite a bit, and I love the convenience of those single-serving packets, especially for traveling (I even slip a couple in my TSA-approved toiletry bag for plane snacks). As far as I know, none of the others is vegan, but there is another delicious product that is: Askinosie Chocolate Hazelnut Spread. It’s made with local, Holmquist hazelnuts and bean-sourced cacao. According to the nutrition info on the jar, it’s very similar to Justin’s, nutritionally speaking. I like it better, though, because it has a nice smooth texture (pourable when warm, spreadable when softened a little out of the fridge) rather than the rougher texture of Justin’s. I also think the chocolate flavor is deeper and richer. It is waaaay more expensive, though: 6.5 oz was $16 at Sugarpill Apothecary (the only place I’ve seen it for sale). The price does help keep me from mowing through it, at least! It’s definitely a treat. Oooo…a new one to try! For some reason I seem to be collecting Nutella substitutes lately. I just read your post on the Sugarpill Apothecary, and I’ll definitely check it out next time we’re in Seattle. Great post! 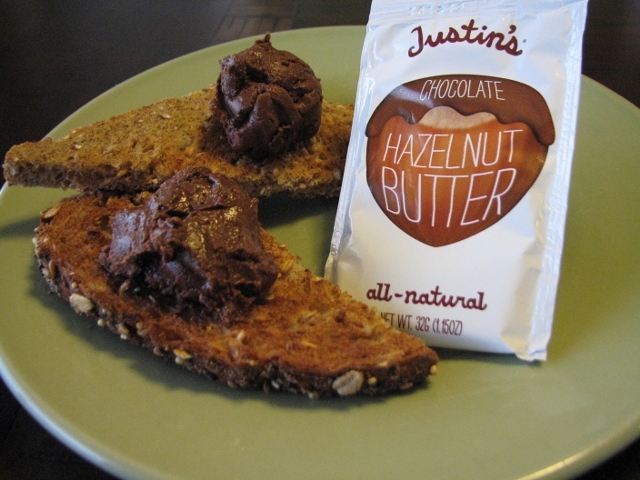 I just tried Justin’s hazlenut spread this morning and am excited to write a blog post about it. I’ll be linking your post so my readers can hear it from another nutrition junkie as well! Thanks for the post! Hi Ashley. So glad you stopped by and enjoyed the post. Thanks in advance for sharing my link! I’ll look forward to reading your post about this yummy chocolate stuff. Just picked up the nicolatta. I love it because its real ingredients and no garbage. It’s a little thicker than Nutella but I just heat it slightly in the microwave to make it spreadable. I’m looking for a cookie recipe to use with this awesome spread. Any suggestions ??? Hi Mary. I haven’t made any Nutella cookies myself but here are a couple you could take a peek at: http://www.vegetariantimes.com/recipe/nutella-cookies/ and http://www.foodandwine.com/recipes/hazelnut-nutella-sandwich-cookies . Good luck and thanks for stopping by! Hi Rachel. There are so many ways to use it – people get pretty creative. I bet it is delicious with the raspberries. Thanks for the suggestion. I’ll have to give that a try! Hi there- I think there’s a typo in your table. I have a jar of Rigoni di Asiago Nocciolata here in front of me and it says 2g of saturated fat per 2 tbsp, not 7g. It should at least beat than Nutella, I would think, because it uses sunflower oil instead of palm oil. Hi Lisa. Thanks so much for the tip. There must be something weird going on because I still have my jar and it definitely says 7 g of saturated fat. I wonder if this is incorrect and they’ve since updated their labels? Maybe you have a newer jar? I checked a couple of online sources. Some say 2 and some say 7, but 2 g certainly makes more sense. I’ll add a note to my table – thanks for the heads up! Hi, The bread in your picture looks delicious. Is it homemade or store bought? Thank you. Great article. Hi Lynda. Well, it’s been a while, so my memory may not be entirely accurate. But, I’m pretty sure it’s Dave’s Killer Bread. We usually buy the Good Seed Thin Sliced or the 21 Whole Grains Thin Sliced. You can find out more here: http://www.daveskillerbread.com/index.html. Hopefully it’s available where you live. Thanks for stopping by the site! I just picked up a jar of justin’s chocolate Hazelnut Butter today and the label is a little different than what you posted (it no doubt changed since then). It lists 180 calories, total fat as 15 grams (3 g saturated fat), 65 mg sodium and 12 grams total carbohydrates. Everything else is the same. Hi Eileen. Thanks so much for letting me know. I think the Nocciolata has updated their label as well, which means it’s time for me to revisit this topic and make sure I have the most current values. I think that healthiest spread on the market is Tahinella, Sweet Tahini Spread. 3 natural main ingredients, certified nuts, no preservatives, nothing artificial. Taste between peanut butter and chocalate. Check it out. Hi Cem. Thanks so much for the suggestion. I’m planning to update this post early next year and I’d love to include some new products. I’ll definitely check this one out. Thanks for the review. There is hazelnut nut spread at some Dollar Trees. I don’t know the name or anything about it. Thanks Jam. I’ll keep an eye out for it! My mum is Italian and gave us Nutella since we were very young. In Italy everybody is eating Nutella on daily basis. Italians are among the people that grow older in the world! I’m always been healthy. I gave Nutella to my children and they are tall beautiful and healthy! We have no problem with Nutella. We live it!